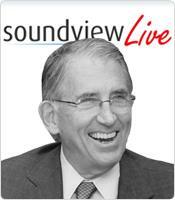 In this Soundview Live webinar, The Remarkable Story of a Big Data Visionary, Charles Morgan will tell us about the data mining gold rush, with a cast of characters in whom you’ll find ambition, arrogance, jealousy, pride, fear, recklessness, anger, lust, viciousness, greed, revenge, betrayal, and then some. It is a messy story. In the big picture, this could be called a narrative of America since World War II. But in the micro telling, think of it this way: The man who opened your lives to Big Data finally bares his own. The history of data mining in the United States. About the bigger-than-life persona of Charles Morgan. About the good guys and bad guys of data mining. The impact of the data mining gold rush on all of us.